Fermi's Large Area Telescope resolved high-energy gamma-rays from an extended region around the active galaxy Centaurus A. The emission corresponds to million-light-year-wide radio-emitting gas thrown out by the galaxy's supersized black hole. This inset shows an optical/gamma-ray composite of the galaxy and its location on the Fermi one-year sky map. The radio galaxy Centaurus A, which is one of the brightestsources of radio waves in the sky, also radiates extremely high-energygamma-rays, new observations from NASA's Fermi Gamma-Ray Telescope have found. "This is something we've never seen before in gamma-rays,"said Teddy Cheung, a Fermi team member at the Naval Research Laboratory inWashington, D.C.
Scientists think these gamma-rays, the highest-energyform of light in the universe, began as remnant radiation from the Big Bangthought to be the beginning of our universe about 14 billion years ago. Butthis radiation has been amped up to higher energy levels by the energeticparticles zooming around magnetic fields in huge lobes that extend from eitherside of the galaxy, researchers said. This ramp-up in energy of photons isthought to be a fairly common process in the universe, but is the first time ithas been observed in this particular situation. Centaurus A is also an active galaxy, which means that itscentral region that exhibits strong emission across many wavelengths of thelight spectrum. Active galaxies are powered by an actively feeding blackhole millions of times more massive than the sun. In a radio galaxy, "the black hole somehow diverts someof the matter falling toward it into two oppositely directed jets that streamaway from the center," explained Yasushi Fukazawa of Hiroshima Universityin Japan, and a member of the team that studied the gamma-ray emission. These jets contain magnetized particles that move near thespeed of light. Over the course of tens of millions of years, the jets expandout into two large lobes that straddle the central source of the galaxy andextend out into space about 1 million light-years. The radio waves from thelobes arise as high-speed electrons spiral through the lobes' tangled magneticfields. 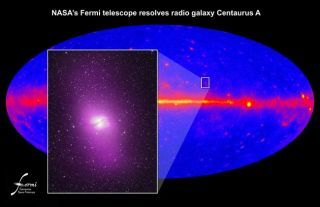 When Fermi turned its eye on CentaurusA during its first 10 months of data collection, it found quite a surprise:In addition to the radio waves known to emanate from the lobes, Fermi alsodetected gamma-rays radiating from the galaxy. "Not only do we see the extended radio lobes, but theirgamma-ray output is more than 10 times greater than their radio output,"Cheung said. The gamma-rays arise through a process that involves thespiraling magnetic fields of the radio lobes and other low-energy radiationthat permeates the universe: Photons from the cosmic microwave background (theremnant radiation of the Big Bang), as well as infrared and visible light from starsand galaxies, can collide with the high-energy particles zooming throughthe lobes of Centaurus A. "When one of these photons collides with a super-fastparticle in the radio lobes, the photon receives such an energy boost, itbecomes a gamma ray," said team member Lukasz Stawarz of the JapanAerospace Exploration Agency (JAXA) in Japan. The process that accelerates the photons up to gamma-rays iscalled inverse Compton scattering and is a common way of making cosmicgamma-rays. The process had been known to produce X-rays in dozens ofactive galaxies, but Centaurus A is the first case where astronomers have solidevidence that that microwaves can be boosted up to gamma-ray energies. Cheunghad theorized before Fermi launched (in June 2008) that the process would workand produce gamma-rays in this way for galaxies like Centaurus A. The team is also looking for the gamma-ray emission fromanother active radio galaxy, Fornax A. The discovery is detailed in the April 2 issue of thejournal Science.